Hotel Marketing Tool for Hotel PMS - Innsoft, Inc.
Innformer is a powerful hotel marketing tool that produces reports, direct marketing labels, mail merge letters* and sales charts. 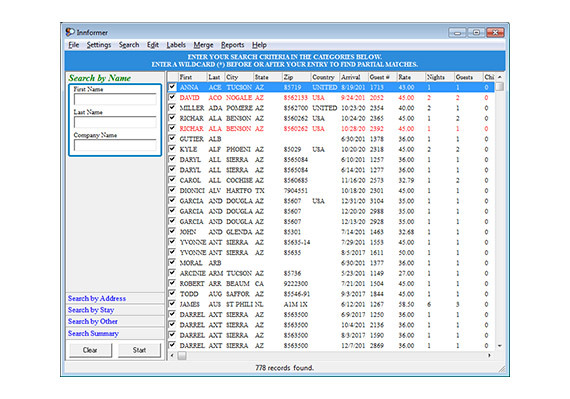 Working in conjunction with Check-Inn property and guest management software, Innformer searches guest reservation data according to your preferences. Search results may be sorted into subcategories, such as zip code, city, state, and market code. Innformer also provides insight on how guests are finding your property. By performing searches based on market code, you can identify successful marketing techniques, saving wasted advertising costs and optimizing your hotel marketing budget. Spend your hotel advertising dollars where they can count the most! * Microsoft Word is required.